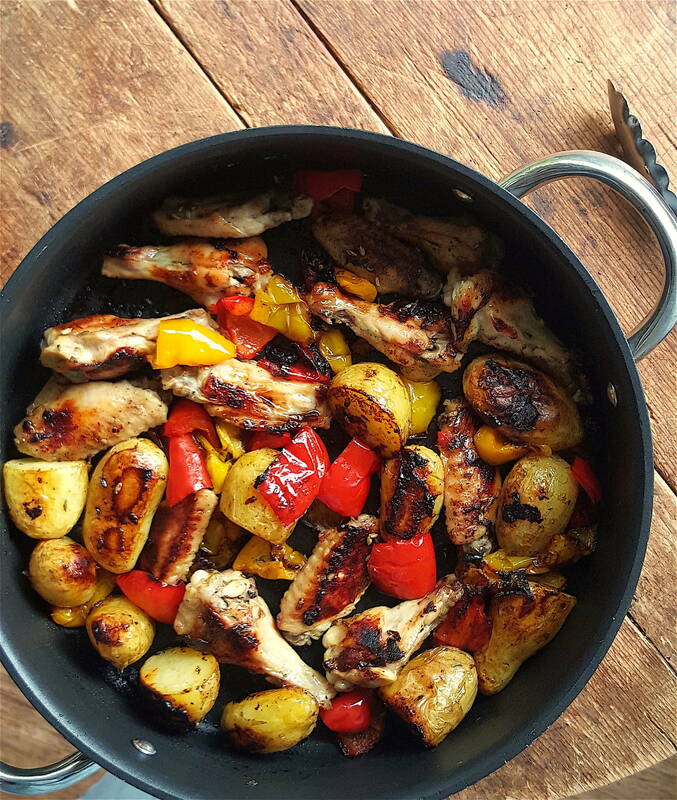 Pure delight – a dish that makes the most of a couple of peppers, a bag of spuds and a handful of chicken wings. 1 Preheat oven to 200°C (400°F). Cut peppers in half, remove cores and seeds and cut into fat hunks. 2 If potatoes are freshly-dug, scrape off dirt under running water. Alternatively, peel potatoes. Cut large potatoes into chunks the size of an egg. Put potatoes, chicken nibbles and peppers in a roasting tin or metal oven dish (it will help brown more than china). Drizzle with olive oil, making sure potatoes are coated. Sprinkle with sea salt (use less salt if using regular salt), scatter with fennel seeds and grind over black pepper to taste. Shake everything around in the tin. 3 Bake for about 30 minutes (if your oven is a fast roaster, have a peep a few minutes earlier), and give everything a stir around. There won’t be much browning going on at this point and things will most likely look a little moist. That’s good. The moisture has helped create a little steam to get cooking underway. Now you need to get things browned. 4 Cook for a further 30 minutes or so, removing the tin from the oven every 10-12 minutes and give a good stir; if you don’t stir, things will burn. You want to get the maximum rich colour you can without blackening. If the peppers char before the potatoes or chicken nibbles, remove them to a side plate. The last 10 minutes are critical. They are ready when they are a gorgeous burnished brown, smell amazing … and you can’t wait to eat them. If I could resist harvesting my fennel bulbs, they would have babies, slim fennel-ettes would start forming that I could pluck out leaving the plant to continue growing and forming more of the same. But I can't, of course.